It took a week to get to this point, but today I have two loaves of delicious fresh sourdough from my new starter. 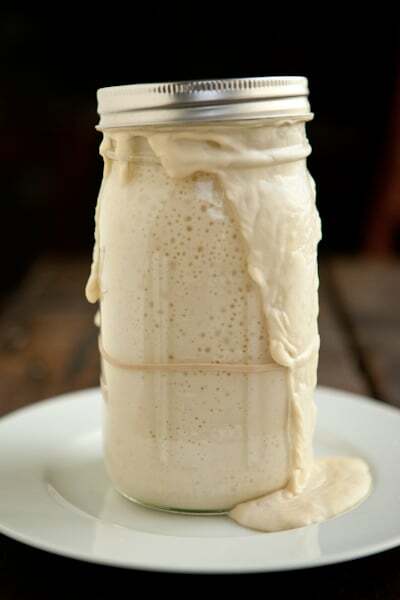 If you’re just tuning in and want to learn how I created my sourdough starter, begin here. Even though I’ve been making sourdough bread from scratch for over 5 years, it still amazes me that something so delicious can come from only 3 ingredients: flour, water, and salt. I didn’t use any special equipment to make this bread – it was mixed and kneaded by hand and baked in a home oven on a regular sheet pan. Anyone can do this. It’s true that I do own lots of special equipment for baking bread. If I had taken some extra steps, this bread would have been even more beautiful, with a dark golden crust and open crumb. But I really wanted to show you how easy it is to bake sourdough bread at home without any special knowledge or equipment. Sure, with some instruction and practice, anyone can learn to make bread that looks like it came from the bakery. We’ll get to that. But if you’re new to sourdough and don’t yet own a kitchen scale, instant-read thermometer, stand mixer, baking stone, or proofing baskets, don’t worry. You can make this bread and it will be delicious. You need to let this sponge sit out at room temperature for at least a couple hours, but it can be as long as 8 hours if you want. You can even decide to refrigerate it after a couple of hours and continue the rest of the process the following morning. The longer you let the sponge ferment, the more sour your bread will be. The temperature of the room is also going to have an effect. The warmer it is, the faster the sponge will ferment and vice versa. I like to let the sponge tell me when it’s ready. After you mix up the sponge, it will start rising. At a certain point, it will have risen as much as it can and it will slowly start collapsing. You see how the surface of the sponge has wrinkles in the middle? This is what I look for as a sign that my sponge is ready to be mixed into a bread dough. Now it’s time to stir in the salt and extra flour to make the dough. I start by whisking the salt into a cup of flour and stirring that into the sponge. I then keep adding more flour, a little at a time, until it’s too hard to mix the dough with my wooden spoon. Next, I sprinkle flour over my kitchen counter or bread board (in this case, I used the board) and then scrape out the dough. I then dust my hands with flour and start kneading. The dough will be sticky, so you’ll want to have flour nearby to dip your hands into and you’ll need to sprinkle a bit on the board under the dough as the dough starts sticking. Use only as much as you need to keep the dough from sticking – you want to keep the dough fairly soft. For instructions on kneading, go here. 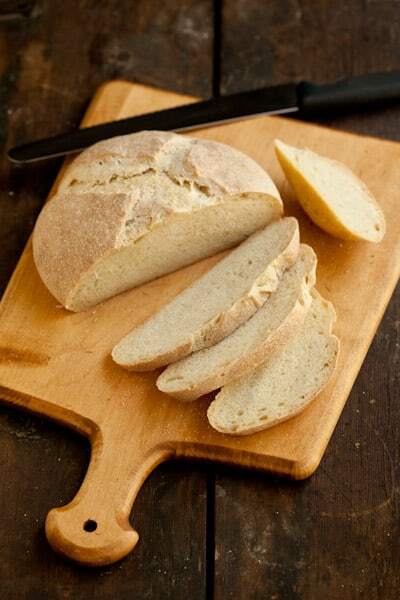 Although I said that you don’t need any special equipment to make this bread, a bench scraper is really very helpful. Sourdough is stickier than other bread dough and the scraper helps to lift up the dough to sprinkle more flour underneath when it starts to stick to the board or counter. It’s also very helpful when cleaning up flour. You want to knead the dough for about three minutes and then let it rest. I just cover it with a towel and leave it for about ten minutes. 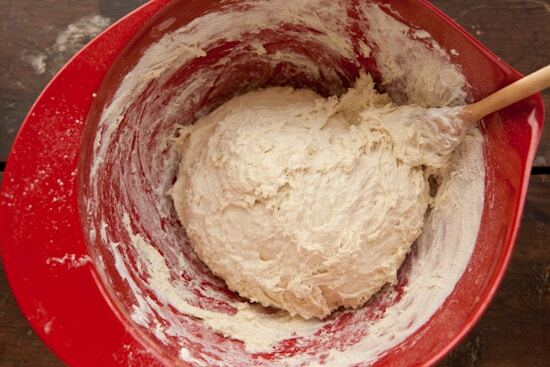 While the dough is resting you’ll need to clean and dry the mixing bowl then spray or rub it with oil. 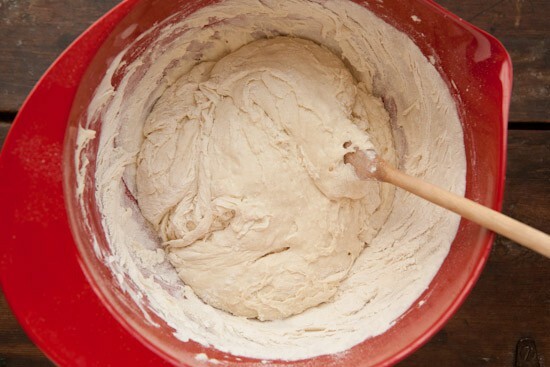 After the dough rests, you’ll continue kneading for another few minutes, until the dough is smooth and elastic. Next, place the ball of dough into your greased bowl and turn it so that the top is lightly coated in oil. Now cover the bowl and put it in a fairly warm spot. If your kitchen is cold, put it on top of the refrigerator or in the oven (turned off) with the light turned on. 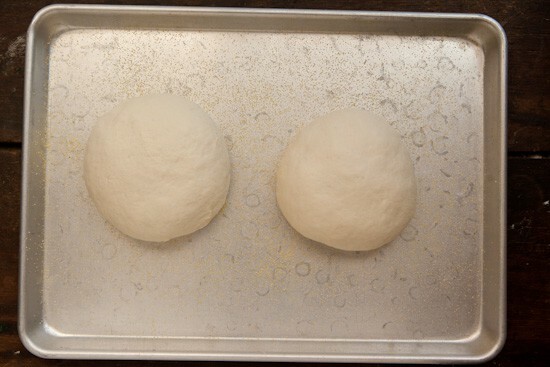 Let the dough rise until doubled in size, about 1 1/2 to 2 hours. 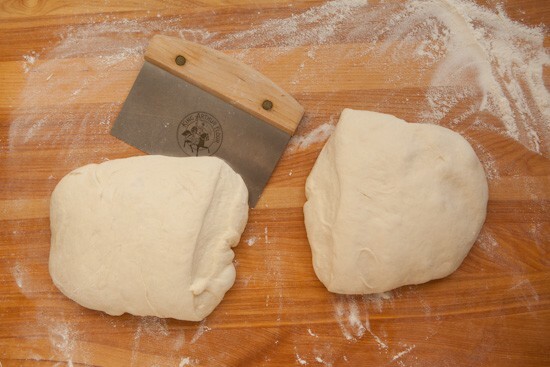 One way to test if the dough has doubled is to push a couple fingers down into the dough. 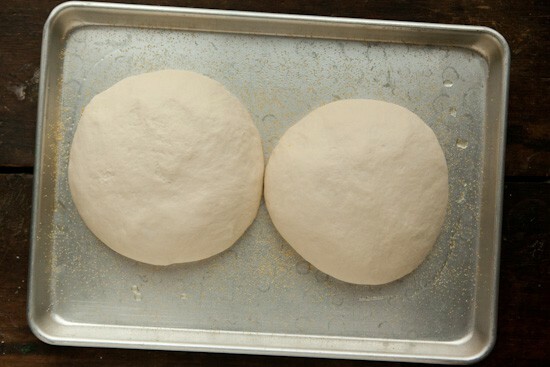 If the holes don’t fill back in, the dough is ready to be shaped. Carefully dump the dough out onto a lightly floured surface and divide it in half. Again, a bench scraper works well here, but you can cut it with a knife. You want the pieces to be as equal in size as possible. Next, shape the loaves. You can form them into whatever shapes you wish, but I find round loaves (also known as boules) are the easiest. For instructions on shaping, go here. Place the loaves onto a lightly greased baking sheet that has been sprinkled with cornmeal. You’ll want to cover the loaves while they rise. You can used plastic wrap that has been coated in spray oil or get creative like I did. 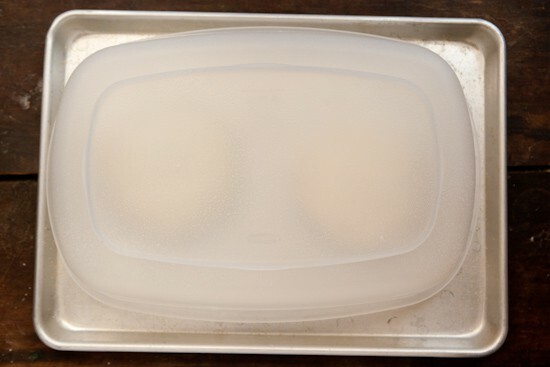 I just used a big plastic container that fit over both loaves. I did spray the inside of the container with oil just in case the loaves spread out while rising. Again, let the loaves rise in a warm space until about doubled in size. The dough will most likely spread out rather than up, and that’s fine. It should take close to two hours. If the loaves grow into each other, it’s not the end of the world. Don’t try to move them, you may end up deflating your loaves. They’ll be easy to separate after baking. At this point, your oven should be preheated to 450 degrees F. The last step before baking is to slash the tops of the loaves. You can use any sharp knife for this or a razor blade. I decided to try this cutting tool. You can create whatever pattern you want. It doesn’t really matter if you mess up – I’m notoriously bad at this. The dough will be sticky so your best best is to be confident and just do it quickly. Even if your slashes look horrible now, the bread will probably come out of the oven looking pretty good. And even if they’re not the most gorgeous things you’ve ever seen – it will smell wonderful and taste even better. If you can, wait for the bread to cool completely before cutting into it. The flavor and texture continue to develop as the bread cools. I’ll admit that I’m not very good at waiting for my bread to cool before cutting the first slice, so I won’t say anything if you can’t wait. The sponge: Pour the cup of starter into a large mixing bowl. Add the warm water and 3 cups of flour. Beat vigorously with a wooden spoon. Cover this sponge with plastic wrap and put it aside to work. This period can be very flexible, but allow at least 2 hours and up to 8 hours. A longer period (at a lower temperature) will result in a more sour flavor. 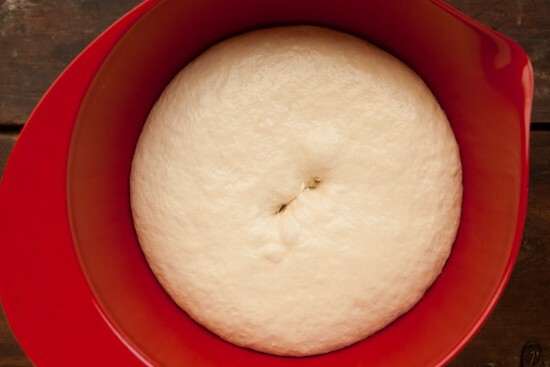 The dough: After the sponge has bubbled and expanded, remove the plastic wrap. Blend the salt and one cup of flour. Stir the flour and salt into the sponge then add more flour, a little at a time until the dough comes together. Turn it out onto a floured board and knead it for 3 to 4 minutes. Give the dough a rest while you clean out and grease your bowl. 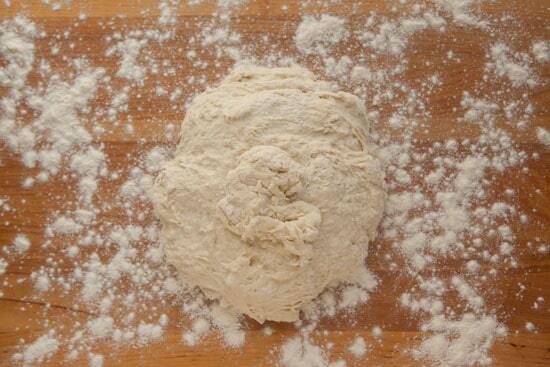 Continue kneading for another 3 or 4 minutes, adding extra flour as needed, until the dough is smooth and elastic. Add only enough extra flour to keep the dough from sticking. 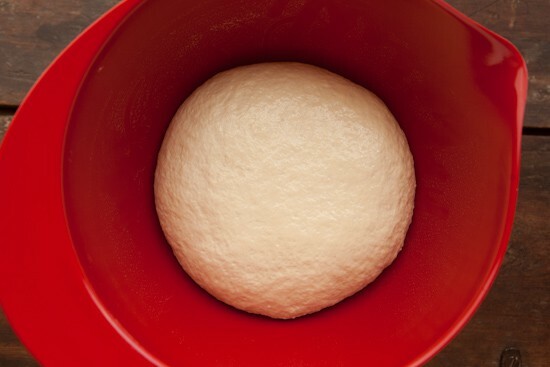 Place the dough in the bowl, turn it once to grease the top, cover, and let it rise until doubled (1 to 2 hours). 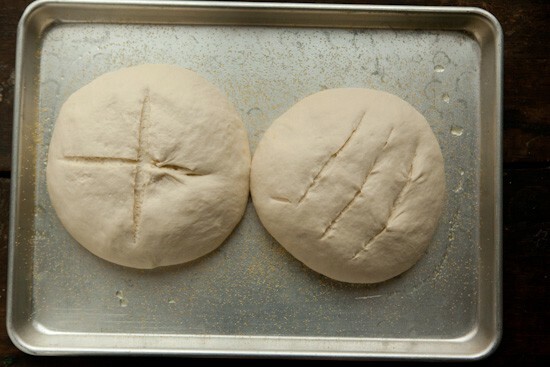 Shaping and Baking: Turn the dough out, then divide in half. Shape each half into a loaf, and place on a lightly greased, cornmeal-sprinkled baking sheet. Cover, and let rise until doubled (this can take up to 2 hours). Remove the cover, slash the tops, and bake in a preheated 450 degree oven for approximately 20 minutes, until golden brown. Turn the oven off, crack the door, and leave the loaves in for another 5 minutes. Remove loaves to a cooling rack and let cool completely before slicing. If you don’t yet have your own sourdough starter, you’ll need to get one from a friend, buy one, or make your own before you can make this bread. Of course I think you should make your own! 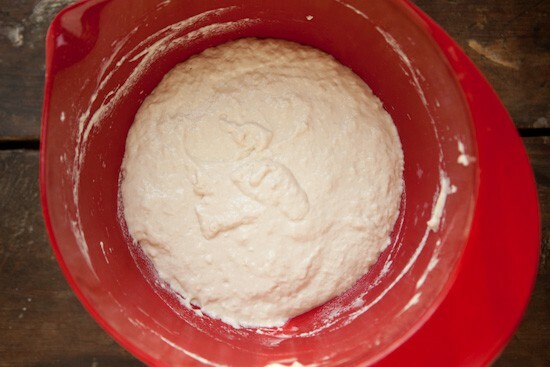 You can follow my adventure making a sourdough starter and find instructions for making your own starter by clicking on the following links. The full instructions are given on each page. An informative how-to! What great looking bread. I'd love to make my own starter....my grandfather used to have a starter (do you believe? ); he made buckwheat pancakes with it! This looks inviting to try.Do i use bottled water or what?? ?I'll have to try this soon.I grew up with saltrising bread an although it is hard to find i stll love to eat it.Sourdough makes the best foundation for a yummy sandwich. I have always wanted to make my own sour dough bread. 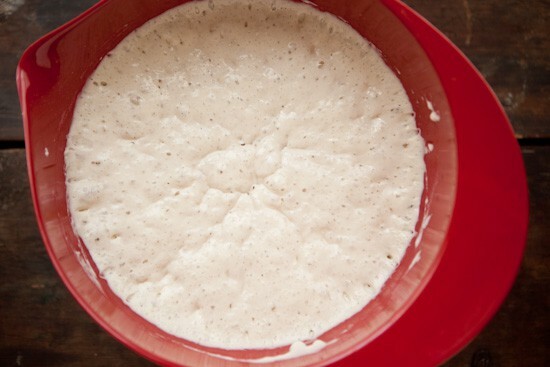 Your tutorial, and the preceding ones on how to make sour dough starter, are terrific. You've given me confidence to try. Great job! Looks so good! Um, can we even eat ours in October? Hehe. Thanks for sharing this!! I'm definitely going to give this a try. Making sourdough bread is definitely a goal of mine - thanks for the clear, step-by-step instructions! Yours looks amazing! Do you think there would be any issues with using my kitchen aid to knead?This looks so good - I plan on using whole hard white wheat (ground at home). Yummy! I just started this same sourdough starter. I hope mine turns out as well as yours did. Great blog! Thank you for your time and effort! This is a wonderful set of instructions :) so easy to follow with a beautiful final product. the sandwich ideas forming in my mind are just endless....yum. Thank you so much for the detailed instructions -- my starter is perking along wonderfully. A BIG question, though. I baked from the instructions today, and everything is perfect ( the rise, the crust, the baking time) except the flavour of the bread, which is pretty darn nothing. What went wrong? Is it the salt, maybe? Do you use kosher or table salt? How else can I adjust the taste? I really want to make an outstanding sandwich-able loaf for my kids, who are obsessed with Pepperidge Farms sourdough for their school lunch sandies. I am SO excited to make this. I love the detailed 7 day lay-out with detailed instructions. It's gotta be fool proof, right? Well, maybe not... but it sure seems like it. Thanks for posting this! I bake my sourdough bread in sizes perfect for carving out into bread bowls to pour chowder into. Sourdough really pairs well with creamy clam chowder. We want to make our own starter. However, the weather is a little too cold here in the Bay Area to make it with wild yeast. We bought the Bread For LIfe Sourdough starter from Azure Standard.It's the easiest starter that I have ever worked with.Thanks for all your photos and tips. Bread making is so rewarding. Hi! Can you use a gluten free all purpose flour or quinoa flour??? I'm kind of worried about my starter. It bubbles well but should part of it be liquid and you need to stir it up? Also when I started my sponge I went ahead and put the salt in in the first cup of flour. Getting excited and ahead of myself. My sponge doesn't seem to be rising. I started it six hours ago. Should I just start over? I'm determined this is not going to beat me! Thank you so much for this post. I've made bread before but it never came out right. I had to redo my starter so I've been looking for a new recipe. This is the first in all my arching that doesn't use a bread machine. I do it all by hand. Can't wait to try this. Many, many thanks for the great step-by-step instructions!I have tried this with some success three or four times, but each time I wasn't able to get enough rise. The bread was very dense, with small bubbles. My starter certainly never "doubled" in volume. This time I tried a few different things which worked wonders.For some reason, everything seems to take much longer than described in this recipe for me, so I decided not to fight it. I let my sponge sit for about 18 hours. Then I actually mixed in about 1/3 cup additional starter from the frothy top of the jar along with about 1 cup of flour and ~ 1/2 cup water and kneeded the dough for about 10 minutes.Then I cleaned the sponge bowl, coated it with olive oil and let the dough sit again for about 10 hours covered with plastic wrap. Then I kneeded the dough again, adding maybe 1/3 cup of flour to get the right consistency. Up until this point I had refrained from adding the salt because I thought it might be impeding the rise. So at this point I flattened the dough and sprinkled the salt in. I did this maybe 5 times - trying to kneed the salt to spread it evenly throughout the dough.Then I cut into two round loaves and let them rise another 2 hours and baked at 400 degrees. This time the loaves look right - they rose much higher than my first attempts, the air pockets are twice as big and the bread tastes much better! What an amazing recipe! I've tried others without much success, but this one worked wonders! I think the key for me was that each step set the right expectations, so I was able to know better how things were going. Thanks for sharing! Brilliant tutorial! I've been making sourdough bread for ages, but always doing it a "bit in the dark". I've never come across the hint about the sponge wrinkling in the middle when it's ready. Thanks so much : ) PS : A hint I've learnt along the way……the longer you let the mix rise the stronger (w factor) the flour should be. Thank you for taking the time to post this... Your pictures and explanation were exactly the factual and easy-to-work-with tutorial I needed! I had previously attempted a very simple sourdough, and it turned out only *adequately. * This recipe was the step I had been looking to take, and it didn't let me down. I used a starter I already had going, but am very much looking forward to making my own per the recipe you provided. I took a few pictures of my experience and posted them here: http://imgur.com/gallery/ftKby.Thanks again! Thank you for all this great detailed information. I have zero baking experience and I was able to make two great loaves on my very first try! thanks for sharing the recipe! Do you have an exact amount of salt that you use? For my sourdough starter I didn't add any. Or does anyone else have any suggestions? Thanks! oops never mind I just read the last part. just kidding! I just want to thank you for this easy to follow and fail proof recipe. I baked two loaves yesterday following your instructions and they turned out perfectly! Everyone thinks I'm so clever, haha. The only thing I changed was that I used whey instead of water which worked fabulously. Today I'm going to have a go at making a pizza base. Thanks again. This is perfect! I've been searching for an all-natural recipe for a LONG TIME--one that doesn't have added commercial yeast. This is so good, just like the way people used to make it. And I've baked this two times, with the second batch's bread HUGE! one measured around 8X8 round, and one measured 5X10 long! Humongous with only that much flour! They are so soft and nutty and filling and delicious, especially with Queso Blanco cheese. Truthfully, you can add anything on top, but Queso Blanco is definitely the best, or any other kind of cheese. Nutella, jam, peanut butter also works well. Perfect for a hearty stew or packed for lunch! This is one of my must-have recipes, and I'm only 12! This a great recipe. I am new at baking bread. Trying to learn all that I can. This is a great recipe. I will be trying it this week-end. Wish me luck.!!!! I made a starter using the whey from my milk kefir last week, and then this week I used your recipe to make the first loaves. Just lovely! And I'm delighted that your recipe doesn't add more yeast to what's already working in the starter. I'm looking forward to seeing how this recipe develops as I try it a few more times and get used to working with live and active yeast instead of the freeze-dried ones. Great article. I've seen quite a few sourdough recipes but yours is excellent in clarity and with beautiful pictures.I've also tried a similar recipe but using a mixture of organic wheat and rye flour. It gets darker and with a slightly stronger taste. Excellent guide! You slash your breads with the razor blade and the two breads come out with a nice somewhat open crumb. But you say that you can create breads with a dark golden crust and open crumb. How do you do this? I mean how do you create an even more open crumb? Also by using the razor blade? Mmmm... I made this bread today and we had some with dinner. It was so good. Thank you for putting together such great instructions. Great blog you have got here.. It's hard to find good quality writing like yours nowadays. I seriously appreciate individuals like you! Take care!! I have just recently started making sourdough bread. Your starter recipe is excellent. I have been successful right from the first attempt. 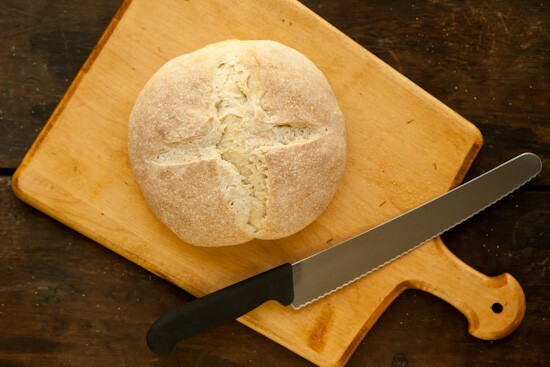 I have tried several online 1 lb bread machine recipes but haven't been able to bake one successfully. 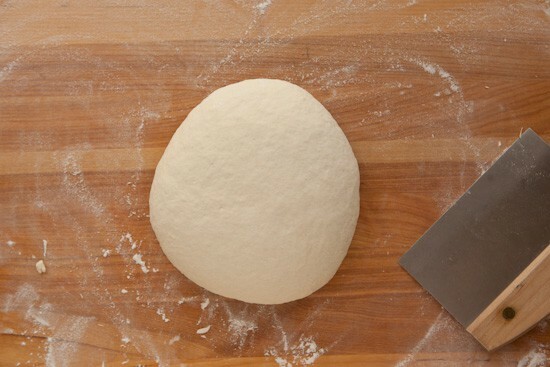 What is the right texture of the dough finally before letting it sit prior to baking. The zojirushi machine doesn't have sourdough bread cycle. Can someone give me some ideas and tips. My daughter in law swears by sourdough bread. what are the baking instructions if I made 4 smaller boules rather than 2 regular size boules? I'd like to make smaller boules to give to friends. thank you! I love this recipe. I've used it a few times. I have tried other sourdough recipes online from no knead dutch oven, to original SanFran style, but this one produces mine and my kids favorite bread. Thank you for the great instructions! My dad and I made this bread yesterday with a week old sourdough starter that was more than doubling in size within 6 hours. We formed two longer loaves and they were delicious!The bread did have a slight sourdough flavor, but not overpowering. After a few bites, it wasn't as prominent. I loved the chewy crust and inside was just right (not too dense and not too light).I let them rise about 2 hours each time. It took that long for them to double, but it also could have been due to the slightly cooler temperatures in the house. For the last rising, proofing, I put them in an oven that was warmed from being used recently to help it along. Next time, I will try to find a warmer spot.I will be using this basic recipe again. Thank you so much for such helpful instructions. I've been trying to make a GOOD sourdough loaf for some time now. I finally did, with the help of your instructions. I've followed recipes before, but I've had trouble judging when I'm ready for the next step. Your tips about knowing when things are ready to go (the wrinkle in the top of the sponge, the two fingers pressed into the dough. Those types were exactly what I needed, and the difference is amazing! Thanks for the great recipe. I used this page several months ago and am ready to make another loaf for Thanksgiving. Very grateful that your recipe is still one of the top Google results but this time I'm pinning it. Hi! Love the recipe! One quEstonia on the flour though, is 5-6 cups the total for the recipe including the sponge or just for after the sponge? I'm not understanding why your kneading time is so dramatically shorter than every other recipe I've ever read? I've tried your recipe and got hockey pucks. Sponge......I'll give you a sponge. So glad for your recipe as my baby turned out really yummy. She looks like a volcano erupted, though. I did a crisscross slice across the top. What made her erupt? Thank you so much for the great recipe and detailed instructions. Now I'm making this bread every week and sharing it with family and friends. For the first time I'm making really good sourdough bread. Your recipe is so easy and I can't wait to try the bread. Fyi, I used a well cornmealed pizza stone to bake the bread on, but I didn't grease the stone. I also used two cups of boiling water set in the back of the oven for the first 15 mins, then removed the boiling water and baked the bread another 10 mins. They came out perfectly crispy. Thanks for your recipe. 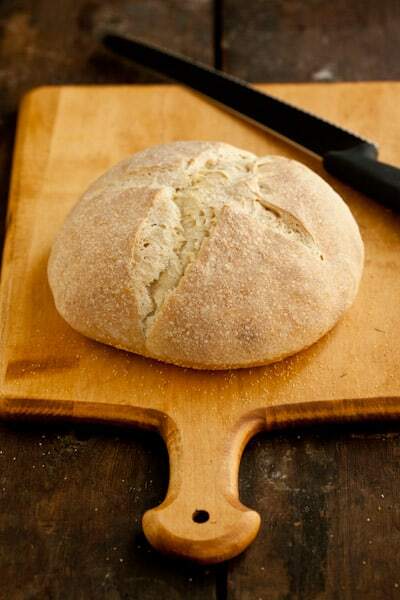 Great tips and helpful tricks for the perfect sourdough bread! Thank you! I have forgotten to take out half and so I added twice the flour. So now I have extra starter I would like to get good before sharing the starter. Can I bake every day from the starter and how just feed with double amount then use I am lost. 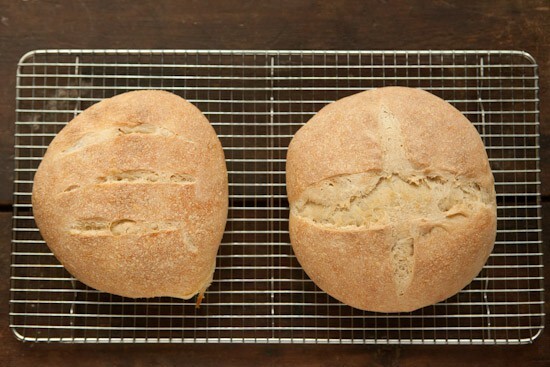 I am baking two loaves now and they have risen beautifully, best blog on sourdough. Thanks. Can you use gluten free flour for the starter? Diana, I would do a google search for gluten free sourdough starter instructions. I know that it can be done, but I don't know much about it so I don't want to offer advice! What is a good pan to bake it in? Diana- You could bake them in 8x4-inch loaf pans if you want sandwich-style loaves. You could also bake the round loaves in a large cast iron dutch oven, one at a time, if you don't have a baking stone. Ive just reached the stage of making the sponge and followed the directions very carefully -however - in spite of using the exact amount of water it turned into a heavy dough! I had to add quite a bit more water. Could the fact I used some wholemeal in it make cause this?